There was some seriously tough competition with a total of six former world number one riders in the lineup for the day. Following on from the previous qualifier in Oslo, all eyes were on Daniel Deusser to see if he could pull off a double win. Historically, a qualifier in Verona has never been won by a woman before so the ladies of the sport were all vying to change that this weekend! Janika Sprunger and Bacardi VDL for Switzerland posted the first clear of the day on a course which was entirely different to Oslo – a larger arena, with lots of forward, flowing distances, relaxed classical music playing in the background and a far less twisty course than the previous leg! 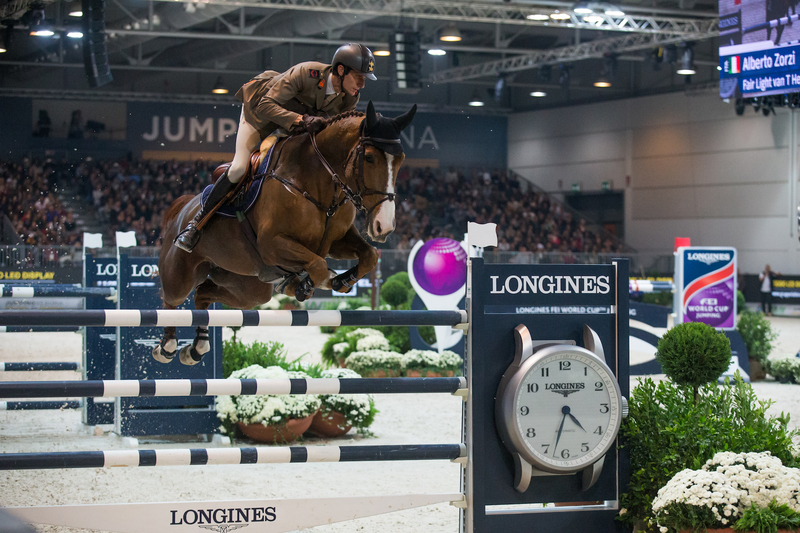 The Italian members of the crowd were given something to really cheer about when Luigi Polesello, Emilio Bicocchi, Lorenzo de Luca and Alberto Zorzi all went clear and qualified themselves for the jump off on home soil much to the delight of the audience in Verona. After a good performance in Oslo, Edwina Tops-Alexander knocked one pole and was out of the running for a placing. Cian O’Connor on the other hand was absolutely determined to go clear when he cantered into the ring on the incredibly scopey ten-year-old gelding Skyhorse, despite losing his stirrup over the final fence. Second last to go was Christian Ahlmann and Colorit who had one pole down with the team manager Otto Becker looking on. Last was Daniel Deusser on SX Hidalgo VG for his first World Cup Qualifier. Daniel won the first qualifier in Oslo so would have had high hopes for this round, but sensibly retired when it quickly became clear that his relatively inexperienced horse was not quite ready for today’s course. The jump-off course left plenty of room for riders to ride in a good forward rhythm, jump at tight angles, turn close to the fences and have a good gallop down to the final fence. Eleven riders through to the jump off, Janika Sprunger had the unenviable position of being first in. She was already looking like her dreams had come true just by reaching this stage – after a long time off for Bacardi and only his second time jumping indoors – but that didn’t stop her going for Gold and laying down a clear round with a reasonably fast time of 39.21. The first of the four Italian riders, Luigi Polesello had eight faults so it was left up to his three successors to bring home a podium placing for the crowd. Emilio Bicocchi was fast but unfortunately seemed to have a couple of minor miscommunications with his horse, resulting in two poles down. Cian O’Connor and Skyhorse had a stop at fence two of the jump off, giving him ten faults overall including time faults and dropping him to the bottom of the second-round rankings. By the time Penelope Leprevost had gone it was looking likely that a woman might, in fact, take the win for the first time. It was not to be though, with the remaining riders putting on a riding masterclass starting with Lorenzo De Luca’s tight turns earning him clear which shaved over a second off Sprunger’s time. Belgian rider Pieter Devos went even further, bringing the time down to 37.03 seconds with only three riders left to go. Not to be outdone, Maikel van der Vleuten rode a clear with an impossibly fast time of 35.91 on the experienced stallion VDL Groep Verdi TN, who showed his enthusiasm with by kicking up his heels as he crossed the finish line. Predictably, second last rider Alberto Zorzi trotted in to a huge cheer and round of applause – no pressure then! He jumped a very stylish clear in 36.17 which put him into second place only 0.3 seconds behind Maikel van der Vleuten. Final rider Simon Delestre aboard Hermes Ryan certainly wasn’t lacking any speed and came home with the fastest time of the day in only 35.49 but it just wasn’t his day when a slight bump of the Equiline upright left him on four faults and finishing in sixth place. // Swiss Janika Sprunger and Bacardi VDL jumped the first clear of the day. // Cian O’Connor went clear, despite losing his stirrup over the final fence! // All eyes were on Daniel Deusser after his win in Oslo last week, but sensibly retired when it became clear that his horse was not quite ready for the course. // 4 Italian riders - Luigi Polesello, Emilio Bicocchi, Lorenzo de Luca and Alberto Zorzi - went clear and earned themselves a place in an an 11-rider jump-off. // Janika Sprunger went first and jumped 39.21. Impressive as this was just the second time her horse Bacardi had jumped indoors! // Belgian Peter Devos went even further, bringing the time down to 37.03. // Cian O’Connor and Skyhorse had a stop at fence two, dropping him to the bottom of the second-round rankings. // Italians Luigi Polesello had eight faults, Emilio Bicocchi knocked 2 poles down, but Lorenzo De Luca jumped clear on 38.00 as well as Alberto Zorzi with 36.17.